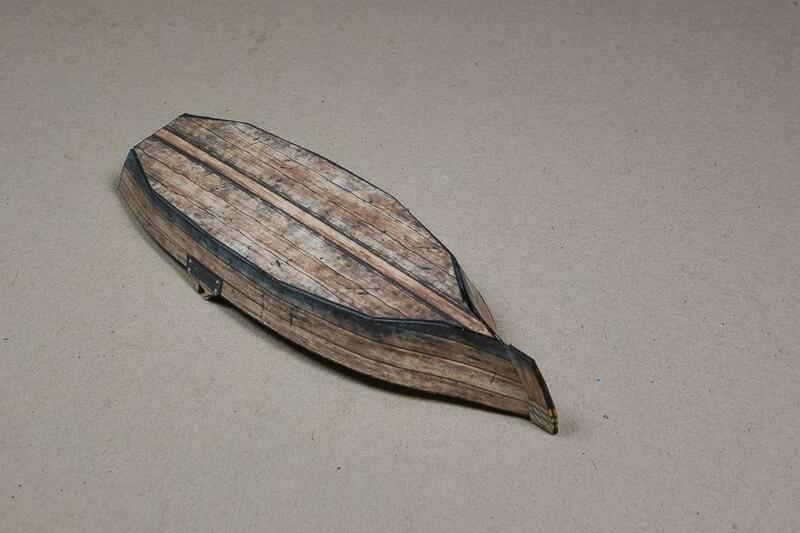 In my introduction I mentioned that I am in the process of making paper model ships set in the "pirate era" and I thought it is a good time to start I start showing what I have got done already. My project is to create a line of papercraft ships with the focus of (tabletop) gaming. So the ships will be waterline model, pretextured and hopefully easy to build (or as easy as it gets) but looking as real as possible. With that I mean, there are quite a few papercraft ship models out there for gaming but they are all very chunky and "blocky" to make the build easy. 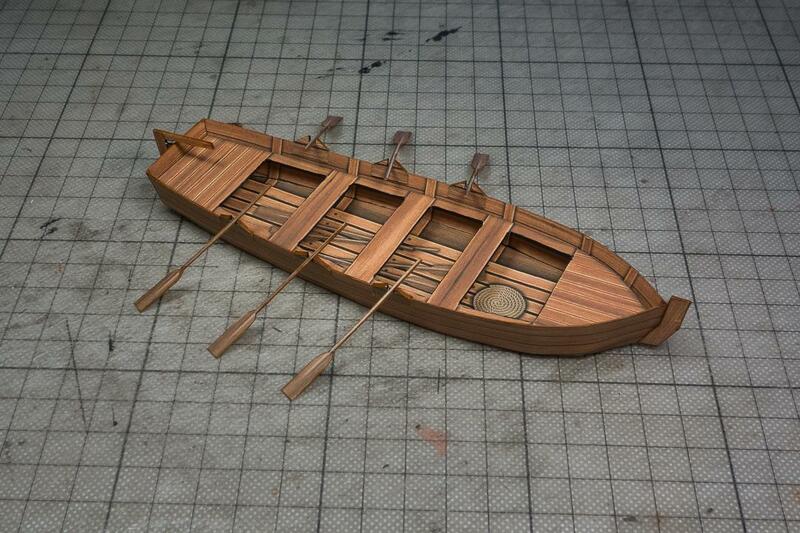 I want to try to get the shape/geometry of the boats as close to the real thing. 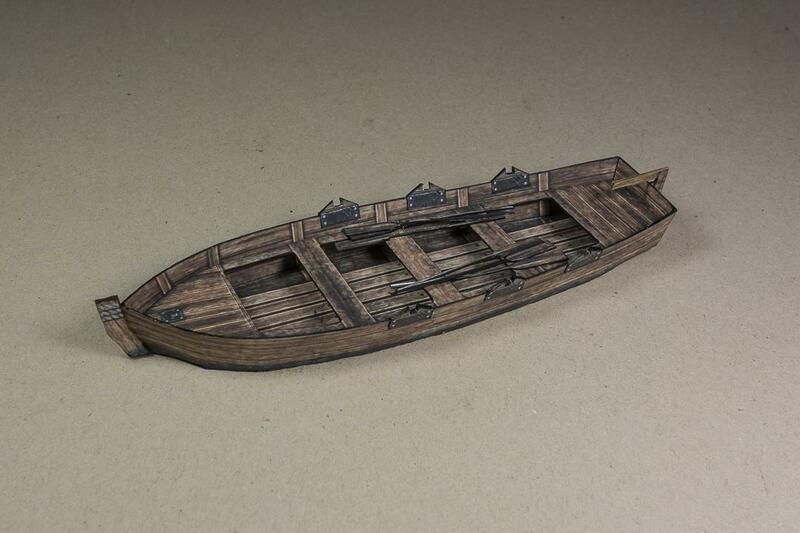 To warm up and get into the groove I have started with these smaller boats and some detail pieces for the larger ships. 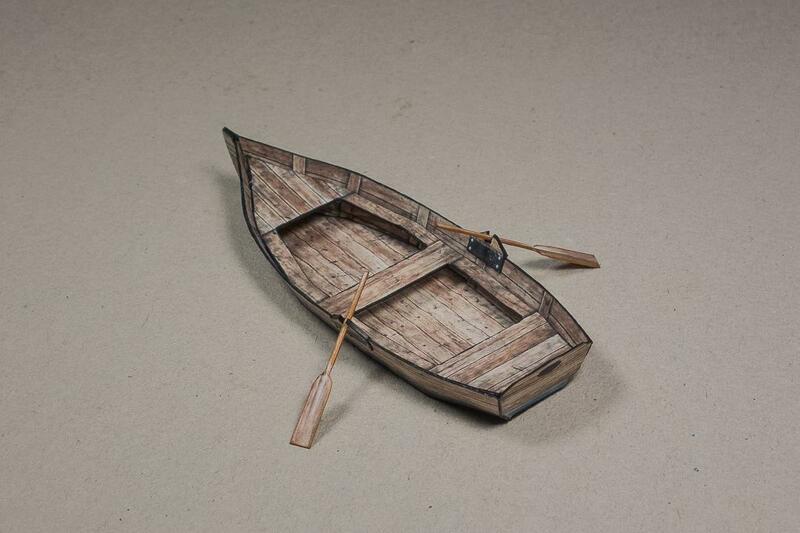 So far I have made what I call a rowing boat and a jolly boat. And then I have been working on some smaller details. 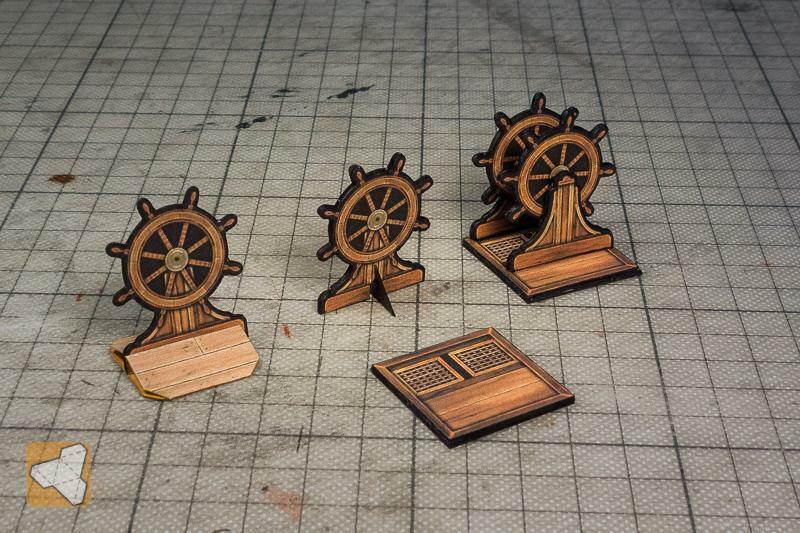 For promotion purposes I made this little part of a larger ship with some gaming paper figures. 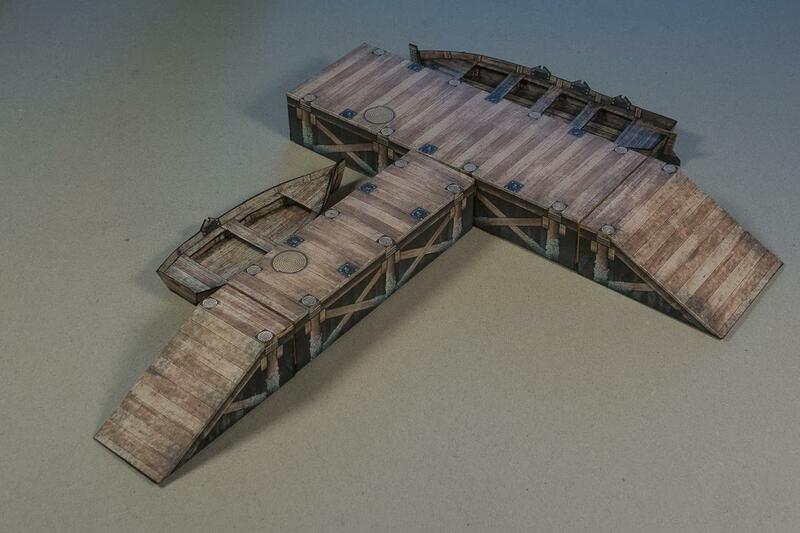 And here I have some docks/wharfs. As you can see with the way I make these I am able to use layers in the files to print, so one can choose different looks and detail options. Now the next vessel I want to tackle is a little larger one, which I call the gunship. 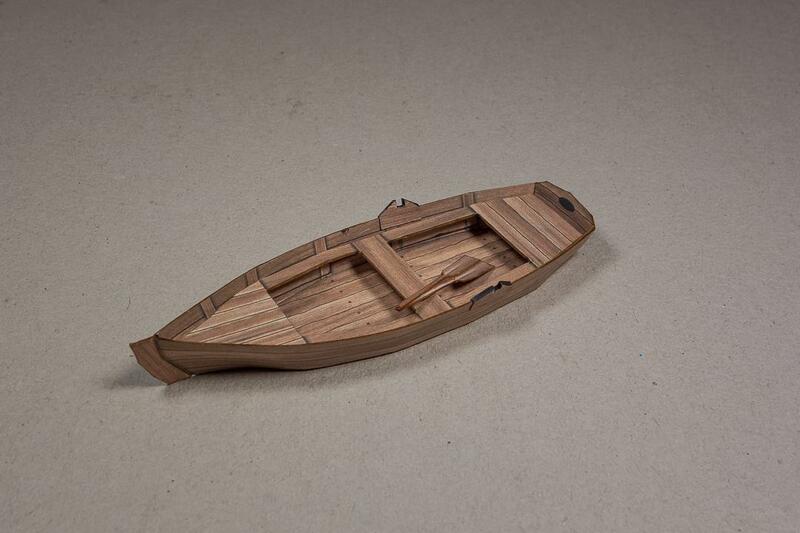 The rowing boat is about 4" long, the jolly boat 6" and the gunboat will be about 8" long. It is the first ship to have a mast and sails. To make proper research I was wondering if you can point me to locations where I can get a good look at the details of mast and sails so I can convert that into a good looking paper model. I would like to see how the the sails are connected to the beams and these to the mast for all the different versions (square sails, triangle sails etc.). Also I have no clue how to handle the rigging, so details in that area would also be great. Looking forward to build a lot of ships with you guys and hear what you think about it all. I know next to nothing about paper ship models but I do remember a Czechoslovakian lady on another forum who made a beautiful paper model of Nelson's Victory. In your search for information about period ships (17th, thru to 19th.century) you might do well to purchase "Historic Ship Models" by Wolfram zu Mondfeld. Although not always accurate it will give you LOADS of info. on this period. 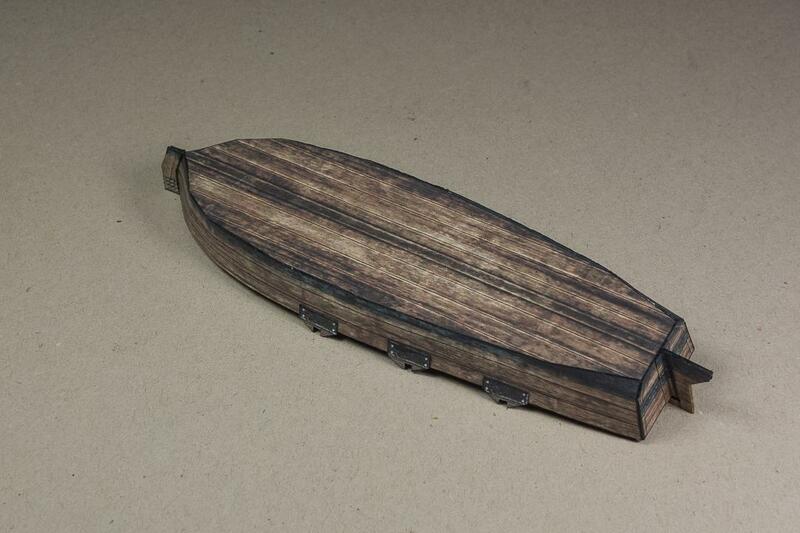 POB : Plank on Bulkhead ---not the real way wooden ship hulls were made. 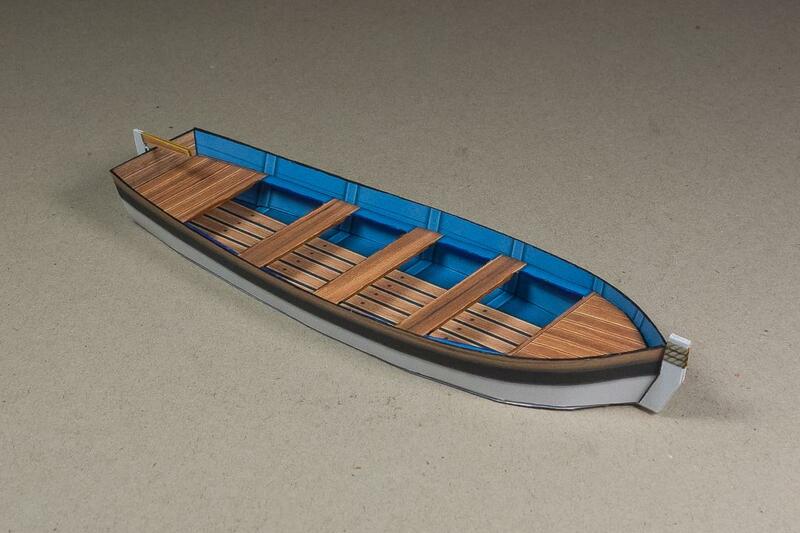 POF : Plank on Frame-----The builder tries to build the hull as close as possible to the real thing. I know the paper model part , I am just looking for reference pics or drawings that show me how the beam is "connected" to the mast and thought somewhere in the wealth of this forum there might be some pics that would clear things up for me. a) The classical "square" sail. b) The triangle sails (sometimes in the front of the ship and sometimes on the back or even as a main sail). c) And some a kind of rectangular with a slanted top sail usually at the back. If I could be pointed to some detail pics I would appreciate it, so I could then try to adapt that to paper model needs. Would the book show me these details? Or maybe there are pictures of real ships showing these details? You are asking quite a lot to cram everything into one or three types of period ship. For instance in the "square rig" there is the barque, barquentine, brigantine (two masts) all having different rigs. it would be best if you look on the "Net". For instance try this:-https://modelshipworld.com/index.php?/topic/9741-attaching-bending-sails-to-yardarms/. You will notice that there is a whole new terminology to learn. It gets even worse when you come to warships and merchant ships. PM me if you like. 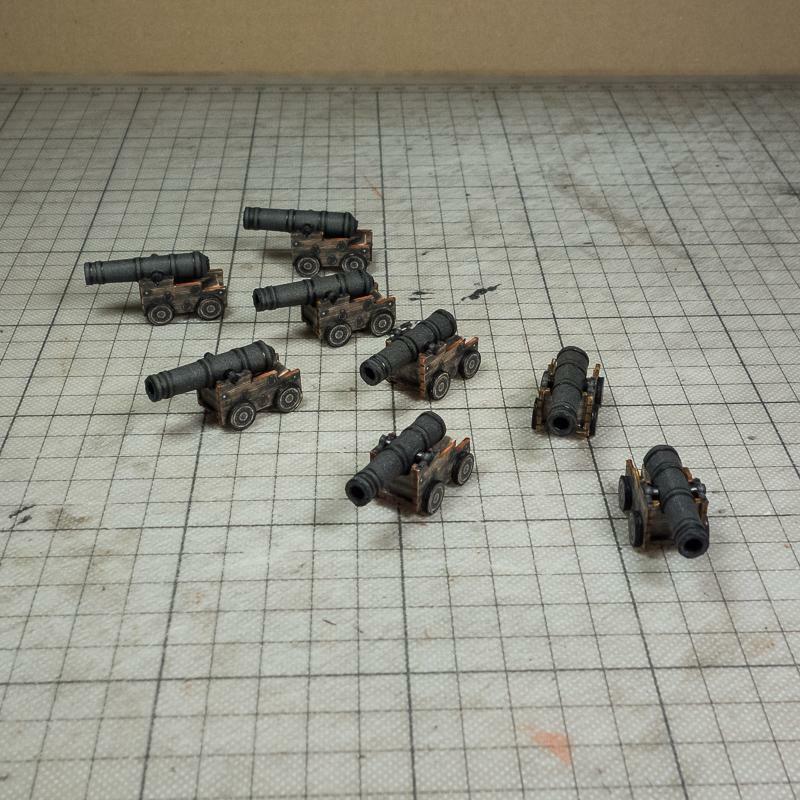 Those cannons are very impressive, you really have to look closely to see they are actually paper. Thank you Keith. The new terminology is a big challenge for me as I don't know what much of these items are called and therefore not having much success with searches. For example, from what I have found until now the "square" sail beam seems to be connected to the mast via some clamp or hinge to keep it close to the mast but then raised and lowered via ropes. This also seems to be the case with the triangle main sails although the rope/rig section is very different. 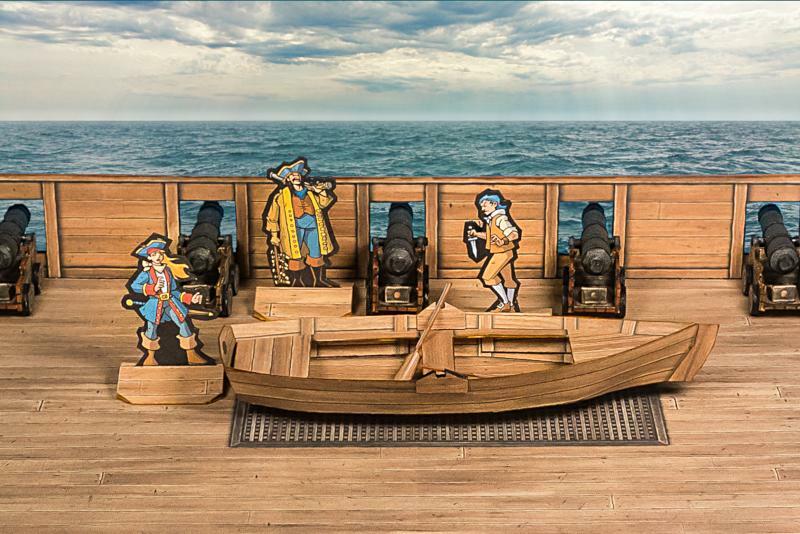 Another way to put my challenge is that I want to find ways that I can make a paper model connection of beams/sails to the mast that will one can take apart (for storage) and assemble again. So for that I just want to see what possible ways have been used in reality focusing on the connection of beam and mast (but not the rigging details). I have been given a list of books on that topic on another forum, so I will try to see what I can find with these. Chris: The 'beams' that go across the masts are called 'yards'. All the yards need to swing from side to side depending on which direction the wind is coming from. If there are 'beams' used for fore and aft sails, they can have varios names, but 'boom' is a good start. Up to the early 19th century the yards were held up and also held against the masts by various arrangements of ropes. Metal fittings were introduced around that period, particularly on the lower yards. The lowest yards on the mast (they're called the 'course' yards) were normally kept at the same height but the ones above could be raised and lowered on the masts. The arrangement could be quite sophisticated using 'Parral beads and trucks' which were really an early version of a linear ball bearing - not something you'd want to make in card! Have a look at this post in Jerry Todd's Constelation build log for details of some metal fittings. A card folded over the yard with two holes in it to fit the mast would function correctly and it looks as though you'd have no problems making it look OK.
Square sails were usually laced to the yards or to a rod (jackstay) running along the yard. Triangular sails were laced to a series of rings around the stays or around the mast. if they were attached to booms, they were laced on in the same way as square sails. As far as pictures are concerned, there are some instructions here. The pictures in your post above are hosted off-site and you have no control over how they display. The problem with this is that the width of the picture determines the width of the display - and of the text in your post and any other posts on that page. If the picture is wider than your screen, the text is difficult to read as you have to keep scrolling across to read the ends of each row. Paper model ships are a new field for me and being curious I would like to ask a question. How do you hang a paper sail (even a paper sail has weight) to a yard? Is the yard also paper? Looks like you have been given enough info at the moment but if you can afford it, your best bet is to buy "Historic Ship Models". Just my humble opinion. These pics and links helped me very much Arthur. This is what I was looking for Thank you very much. I have started learning about the different rigging styles and how the ships and rigs evolved through time. A very interesting subject! I will check the sticky about inserting pictures. I was used to other forums that I could add some height and width info in the img tag but that was for offsite stored images. Once I got up to speed with your way of doing this I will add more pics that way and if possible update the previous ones too. Keith, when it comes to paper models I am a paper purist, so I try to make everything out of paper/cardboard. Sometimes I utilize other items that are available like toothpicks or chopsticks or similar.